If you don’t enjoy the slightly tart taste of apricots, substitute them with nectarines. A true crowd pleaser, this colourful salad is delicious served outdoors, savouring the last of summer. Chargrilled apricots with prosciutto, buffalo mozzarella and basil is the perfect addition to any golden afternoon lunch. Slice 6 apricots in half and remove the stones. Brush the apricot halves generously all over with olive oil. Heat a griddle pan over high heat and when smoking hot, chargrill the apricot halves, 3 minutes per side. 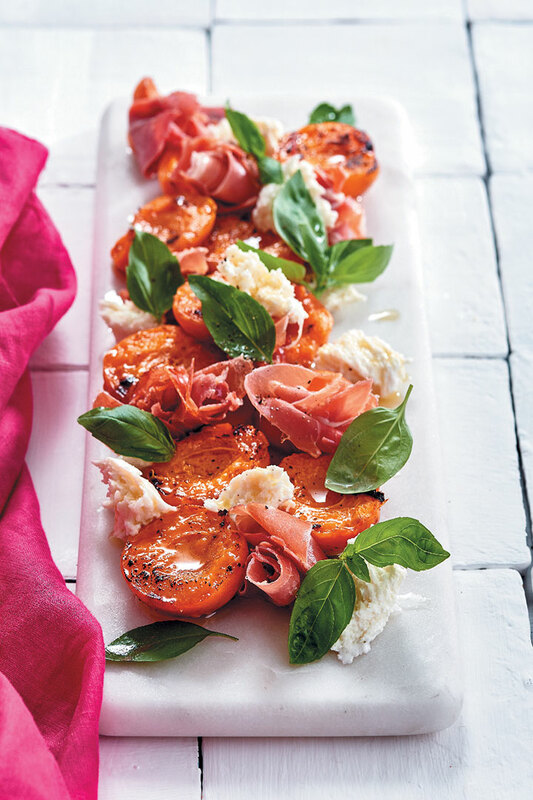 Arrange the chargrilled apricot halves on a serving platter and top with 70g prosciutto, torn and arranged into little twirls. Scatter over 150g torn buffalo mozzarella/fior di latte and fresh basil leaves. Season well with salt and freshly ground black pepper and drizzle over olive oil and balsamic reduction.